In what the Centers for Disease Control (CDC) and Prevention calls a “serious threat,” a relatively new and potentially deadly multidrug-resistant fungus is spreading on a global scale. Whereas normal yeast lives in warm, damp places, Candida Auris can survive on cooler surfaces like skin, potentially remaining for a long time, enabling it to act more like bacteria than a fungus. As of March 29, at least 617 cases of clinical C. auris have been reported in the US with more than 1,000 patients found to be carrying the fungus. 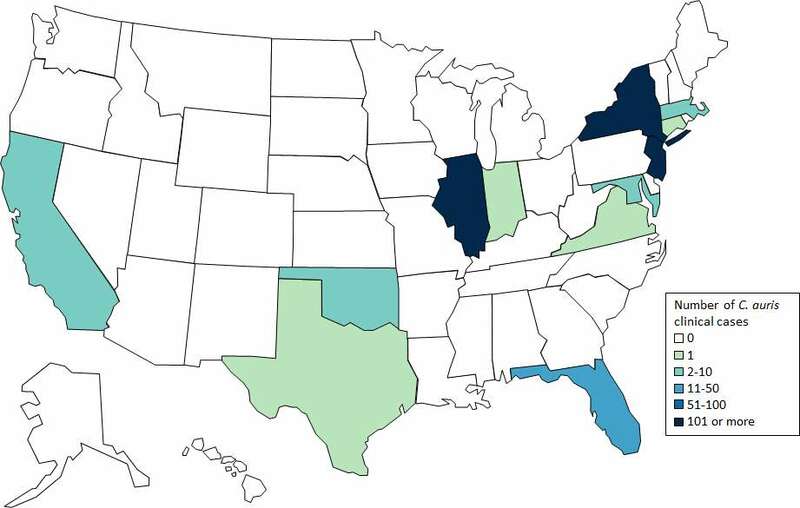 New York has confirmed the most cases at 309, followed by Illinois (144), New Jersey (104), and nine other states. C. auris was first discovered in 2009 when doctors found the fungus in the ear discharge of a patient in Japan (auris is Latin for the ear), though the earliest known strain dates back to South Korea in 1996. Now, it is considered an emerging pathogen and has since spread to other countries around the world including eastern and southern Asia, southern Africa, and South America. Cases in the US are linked to other parts of the world after the fungus was inadvertently introduced by a patient who had received healthcare in a country where it was spreading. What makes it so difficult to treat is in part due to how it is identified, often requiring specific technology and a culture of blood or other bodily fluids. Because it can colonize its host for several months – perhaps indefinitely – the fungus can spread between people and to various objects over the course of time before entering the bloodstream and spreading throughout the body, causing serious invasive infections such as bloodstream, wound, and ear infections. Its treatment is even more difficult given the fact that it does not respond to commonly used antifungal drugs and has shown resistance to those used to treat other Candida infections, such as vaginal yeast infections or oral thrush. Stop living with ugly nail fungus.the fast and simple secret to wiping out your nail fungus. At least 56,000 people in the US and EU die every year as a direct consequence of infection from antibiotic-resistant bacteria, comparable to influenza, tuberculosis, and HIV/AIDS combined. As C. auris is showing us, fungal infections may soon contribute to that growing number. Though the believed risk for otherwise healthy households is low, the CDC says those most at risk are people who have been in a hospital with confirmed cases of the fungus, as well as those who have had recent surgery, have diabetes, broad-spectrum antibiotic and antifungal use, and those who have spent time in nursing homes or with lines or tubes in their body.